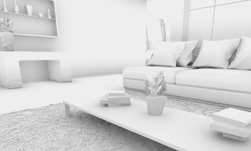 SSAO (Screen Space Ambient Occlusion) is popular, but a limited process being used in contemporary games. Ray tracing provides better results. We explain why, and prove it with a set of side-by-side examples. SSAO is a less-than-ideal process: it darkens the corners and edges in a scene, and leaves a dark halo around object borders. SSAO also can’t handle occlusion from offscreen geometry (or in-screen geometry, but occluded). Actually tracing rays around the geometry in the scene will be more physically correct than SSAO and gives you higher visual quality. Direct comparison between 2spp [2 sample per-pixel] Denoised and Ground Truth are strikingly close. SSAO is clearly less convincing. 1spp works pretty well for far-field occlusion, but for near field contact, we need to get to at least 2spp.